Ayyam Gallery launches the publication, Syria’s Apex Generation which coincides with the gallery's June openings of contemporary Syrian painting featuring artists, Abdul Karim Majdal Al-Beik, Nihad Al Turk, Othman Moussa, Mohannad Orabi, and Kais Salman.The book provides an in-depth survey of movements leading up to this new school of painting that continues to thrive despite the disintegration of the Damascus art scene, its original centre. Building on the aesthetic currents set in motion by pioneers in the late 1950s, the included painters navigate the magnitude of the Syrian conflict with allegory, satire, and realism in works that hint at the influence of preceding modern and contemporary artists such as Louay Kayyali, Fateh Moudarres, Moustafa Fathi, Saad Yagan, and Safwan Dahoul. The book contains over 100 colour reproductions which are accompanied by an extensive essay by exhibition curator, Maymanah Farhat. Book launch and talk with artists Safwan Dahoul and Mohannad Orabi in conversation with Khaled Samawai and Maymanah Farhat. Book launch and talk with artists Abdul Karim Majdal Al-Beik, Nihad Al Turk, Othman Moussa and Kais Salman, moderated by Maymanah Farhat. 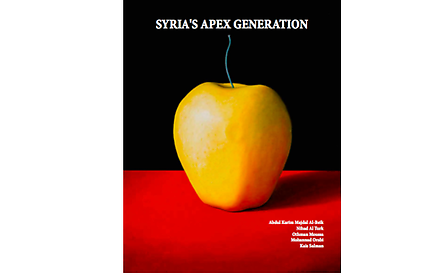 Syria's Apex Generation takes place from 9 June - 2 August in Dubai (DIFC and Al Quoz) and 11 June - 2 August in Beirut.